Zapier is one of my favourite tools. I straight up love what you can do with it. For those that aren’t familiar, it is an automation tool that helps you easily connect different apps together without using a developer. Want to connect Shopify & Mailchimp? There’s a Zap for that. Need to connect Slack and Insightly? There’s a Zap for that. As I use the tool quite a lot I have noticed it just so happens that they are also nailing SaaS SEO. That’s all well and good…. but what’s SaaS SEO? Well it could be a new annoying phrase I have inadvertently coined, as essentially it’s just regular old SEO, but for a software-as-a-service (or SaaS) tool like theirs. In the case of Zapier they have really got things nailed with the Zapbook section of their site. So why is this nailing things from an SEO point of view? They’re number one for pretty much any search you can come up with related to connecting two different SaaS tools together. Now, these search terms don’t have huge search volume every month. Across the various ways you can search for these sort of thing it would certainly add up, but more than the volume, the intent here is phenomenal. People searching for these types of terms are pretty much screaming out they need a tool like Zapier. They would be very close to having their wallet out the second they land on the site. Make no mistake, this level of organic visibility would be driving huge results for Zapier in terms of customer acquisition. Let’s get our nerd on and have a look at each of these areas, as they can be applied to the SEO campaigns for other SaaS tools, or broadly speaking most other websites. 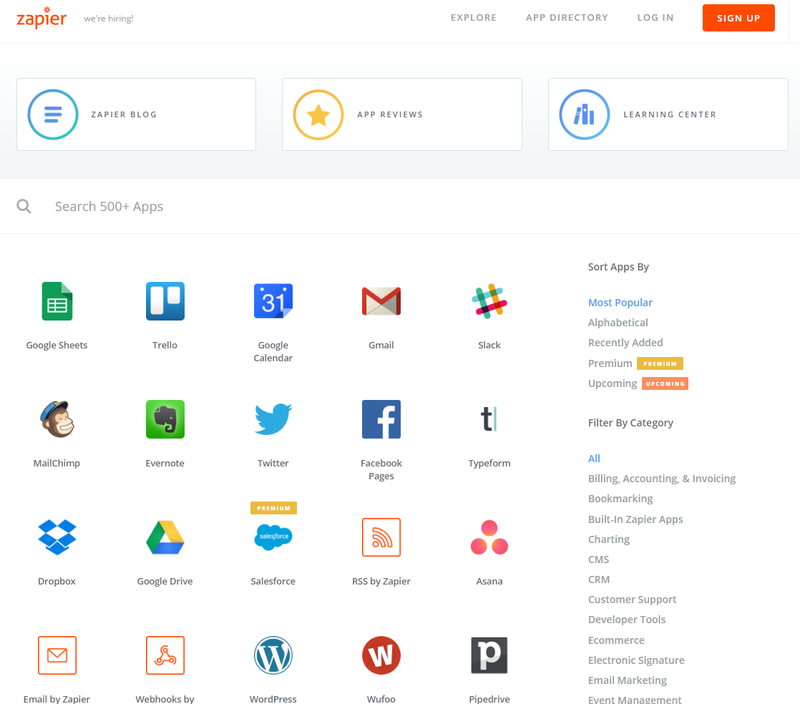 This page lists every single App that Zapier has functionality for, with the logo and the name of the app as a text link. These links help signal to Google that this main hub for the apps is an important page. 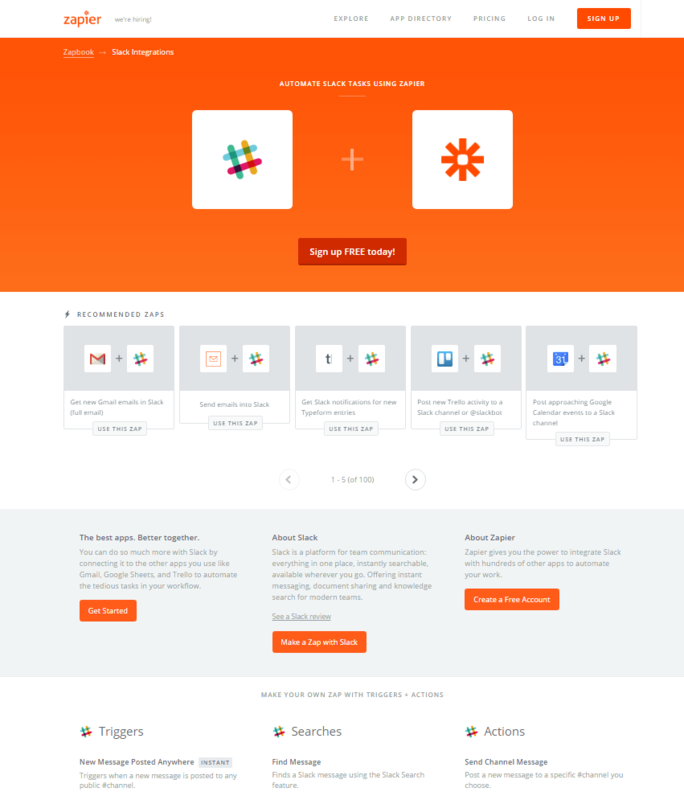 The page speaks a little bit about Slack, gives some example of the things you can do with Slack & Zapier and also gives a list of recommended Zaps (common integrations of Slack with other Apps). 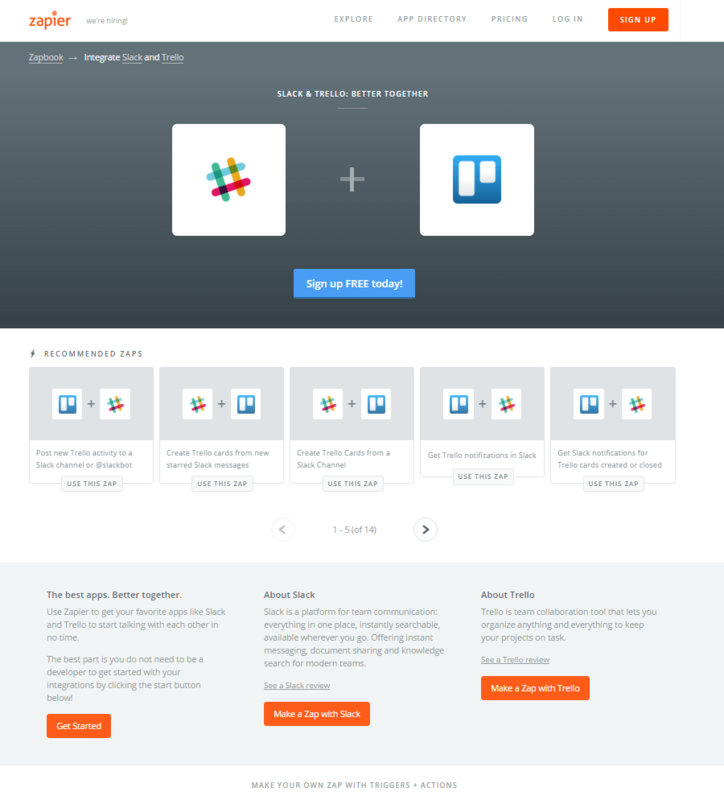 If you click into any of these you are then met with a page which speaks specifically about combining Slack and that tool together. 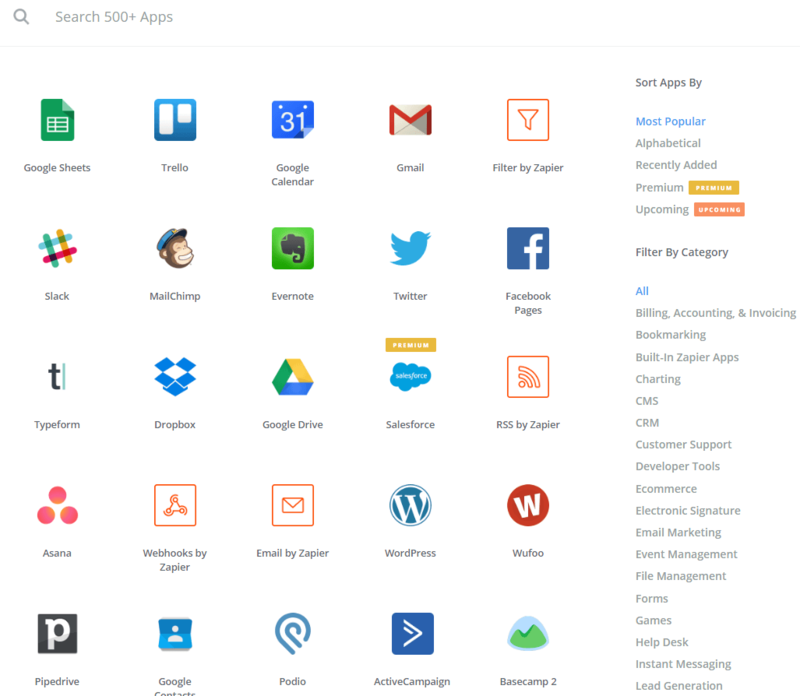 With over 500 Apps in their system this is a lot of different combinations, and hence a lot of different pages and opportunity for Google visibility. Remember how I said Zapier have smashed visibility for pretty much any term related to combining two apps together? 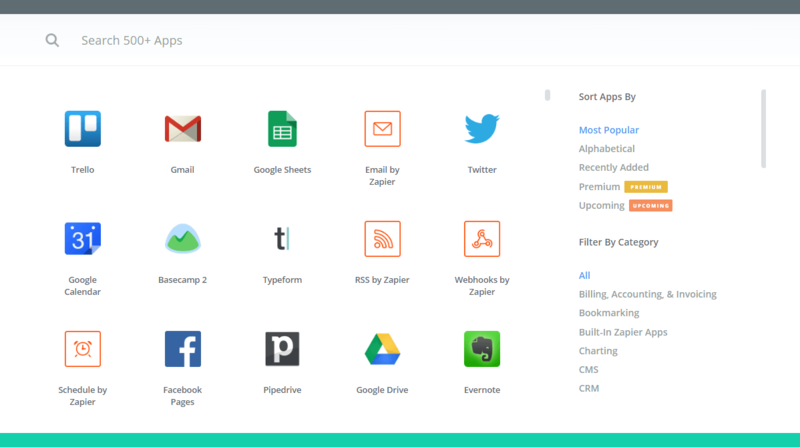 The title tag is ‘Slack & Tello Integrations – Zapbook – Zapier’ – nice and relevant and uses keywords. The URL path is https://zapier.com/zapbook/slack/trello/ – working in both of the app names is a nice way of working keywords in the URL. 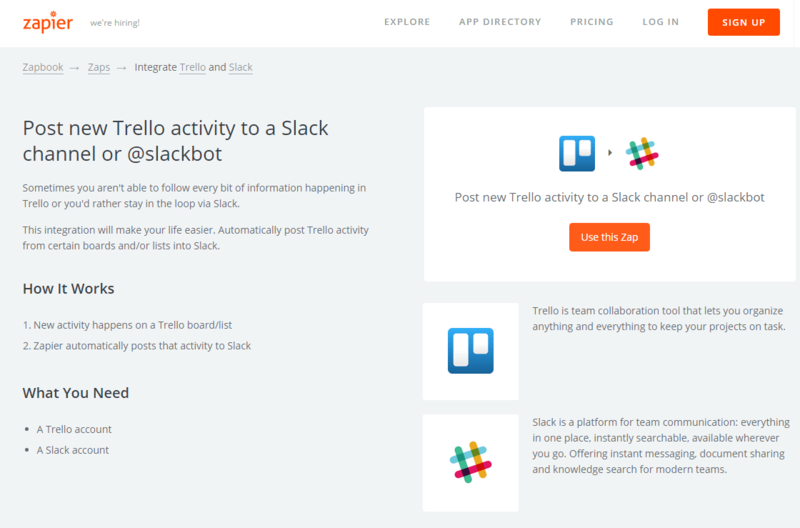 The use of “Slack & Trello” in the text at the top of the page is further reinforcement of the fact this page is all about combining these two apps together. That’s a nice way of working in more keywords and context to the page. So it’s pretty clear they have visibility for the main apps themselves, and then the integration of all sorts of different apps with each other. It all goes further than this though. They also have pages set-up for the specific actions you can perform with the tool, known as “Zaps”. For example “Posting a new Trello activity to a Slack Channel” is a zap, or “Creating Trello cards from new starred Slack messages” is a zap. Each of these is a link to a page for the specific Zap. There are 100 recommended Zaps for Slack alone. Once again they are nailing this page. They’re using plenty of keywords and context on the page that speaks all about the specific Zap and what you can achieve with it. The breadcrumb trail on these pages is now an H2 tag. The title tag for the page is the same as the H1 tag. 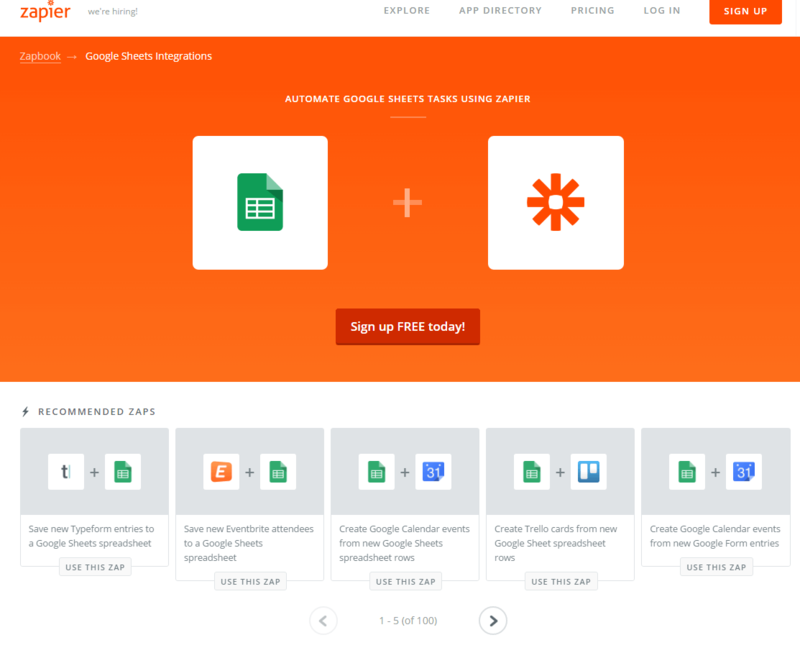 Pretty much every combination of actions that you can think of between two Apps is covered on the Zapier site. When you extrapolate this out across the 500 + Apps they integrate with we’re talking about a lot of pages on the site. Zapier would absolutely be cleaning up and scoring themselves loads of new users through these pages, there’s no doubt about it. Having all of these pages set up is all well and good, but you need to have an internal linking structure in place to help Google find all these pages and pass value to them. Internal linking is an essential part of an SEO strategy like this, however is often neglected when a site is being built. We have touched on some of the internal links used so far, but I figured it would be worth having a more detailed look at how Zapier have gone about it. Ideally you want to make it so that Google can land on all of your most important pages in 3 clicks or fewer. Making it tougher than that is a suggestion to Google these pages aren’t as important. So are Zapier doing this? This means that on your third click you are one one of the above types of pages, and as such all of their most important pages are no deeper than 3 clicks. on every single App, App/combination and Zap page they have built up a huge web of internal links between all these pages. These links are like delicious, sweet linky treats for the Google spider. It would be landing on their site and whizzing all over the place, easily finding all of these pages and indexing them. The Zapier site no doubt receives a tonne of external backlinks due to press coverage and people writing blog posts like this. This internal linking structure they have in place means they make full use of the power of these backlinks. It is all SEO basics, but it’s executed really well, which is where a lot of sites fall down. So there you have it. Pretty simple stuff, but extremely effective. Outside of the SaaS world, pretty much everything covered above is just “good SEO” and is applicable to pretty much all sites out there, so if you’re not executing along these lines it’s well worth taking a leaf out of Zapier’s playbook.